A Public Involvement Plan (PIP) was jointly developed by the KCNs and Manitoba Hydro in the fall of 2007 to guide engagement activities with Aboriginal communities and stakeholders beyond the in-vicinity KCNs. Project engagement and consultation activities were provided at key stages in the environmental review and planning process. Three extensive rounds of information-gathering and consultation activities took place as part of the planning process. Hear from the public how they wished to be consulted in future rounds of the PIP. Consultation focused primarily on communities in the Churchill-Burntwood-Nelson area beyond the Keeyask Cree Nations, including First Nations, Gillam, Thompson, Churchill, Leaf Rapids and Northern Affairs communities. In addition, open houses were held in Winnipeg and Brandon. encourage suggestions for avoiding or minimizing potential adverse effects. 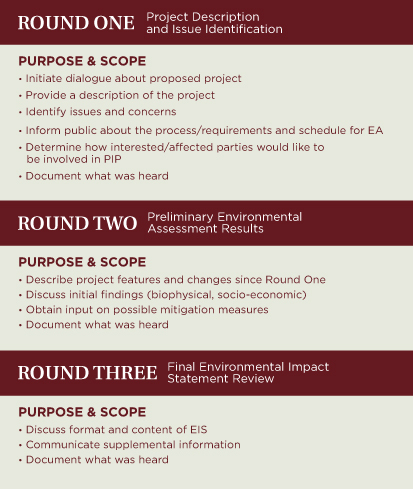 The comments and input received in Round Two were used as part of finalizing the Environmental Impact Statement (EIS). Round Three meetings were held with communities in the Churchill-Burntwood-Nelson area as well as with communities, organizations, and other Aboriginal groups that may be potentially affected by or interested in the Project. Public open houses occurred in Thompson and Winnipeg. Results of Round Three were summarized in a report and filed as supplemental information for the regulatory process.